While much of the general public is obsessed with their favorite sports stars and the latest gossip amongst celebrities, the power elite quietly carry out the agendas that really matter. Now, NWO trading cards allow an emblematic shifting of the focus to what is really important. In the same style as childhood baseball cards, activists and John Q. Public alike can track the stats of the world’s true movers-and-shakers and trade information to wake up the masses. Trade them with the as-yet unawakened individuals and open their eyes to what really happened on 9/11, who and what is the New World Order and who is leading the fight of resistance. 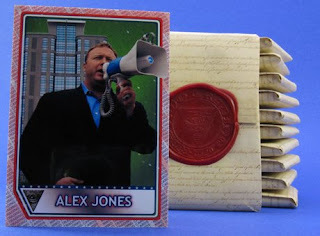 First edition cards include top neo-cons, freedom fighters like G. Edward Griffin and Alex Jones and many others.